WANT TO SUPPORT HYDE PARK ELEMENTARY? At this Title I institution, students are struggling to take their reading and comprehension abilities to the next level. The 3rd grade teachers would like to purchase and install a flat screen monitor in their classroom to remedy this problem. 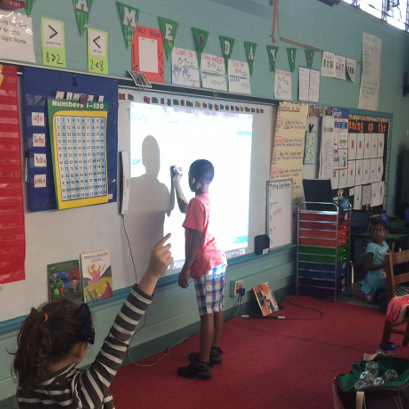 The screen will allow teachers to display presentations so students can to continue to interact with the lesson using the existing whiteboard, leading to increased engagement and improved literacy among students. What is your overall school project need? Our school is a Title I institution with 100% free breakfast and lunch; we also provide an extended program to ensure students in need also receive afternoon snack and a balanced dinner Monday through Friday. We are a transitional school; unlike most elementary schools, we serve students in grades 3-6. Our goal is to bridge the gap to bring them up to standard academic levels by the time they leave us while instilling a passion and ownership in their learning experience. Why does your school project have this need? The majority of our class is made up of children who are living in poverty. Many have already repeated at least one or more grade levels before arriving in my classroom. Students must show reading proficiency on high stakes state tests in order to move on to the fourth grade. On average their reading and comprehension abilities are at least two grade levels below where they should be, putting them at an extreme disadvantage. How will funding support your school project need? Having a flat screen monitor to use in my classroom will increase technology integration and student literacy. We currently have a projector, but when using the document camera or displaying presentations, my entire board is covered up; students are unable to interact with the lesson. Furthermore, students are eventually assessed at year’s end on computers; showing students how to take computerized assessments by writing on chart paper is ineffective and unfair to the students.